Above: Visitors posing in the Expression Space, where the reproduced artworks are by Bindi Mwerre Anthurre Artists. In the foreground the ‘lampshade’ features “Redtail Cockatoos in Flight” by Kukula McDonald; in the centre the work is by Charles Jangala Inkamala. This article has been modified on 28 September 2017 to provide additional details and clarification on artwork attribution and some interpretive material. The outstanding artistic achievement of Parrtjima 2017 is the song “Apmere Ahelhe Itethe”, which means “All Country Is Alive”. 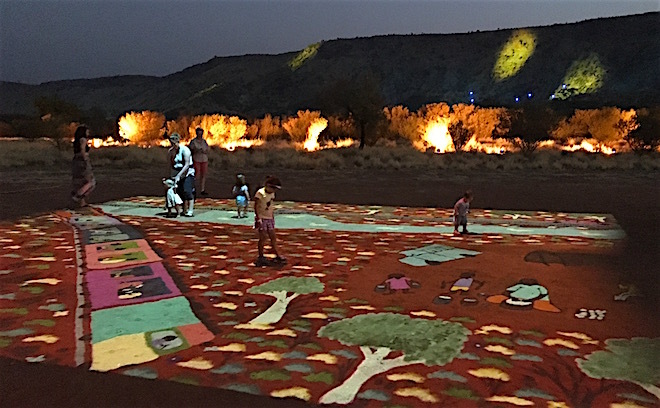 It brings heart, meaning and life to this festival of light, moving it towards more properly a celebration of Arrernte culture on Arrernte country. The message of the song is the indivisibility of the two. Benedict Kngwarraye Stevens, one of the Apmereke-artweye (custodians) for Mparntwe, says of the whole Parrtjima experience, “We hope it helps you understand this country is alive and feel it in your hearts.” The song certainly goes towards achieving that. 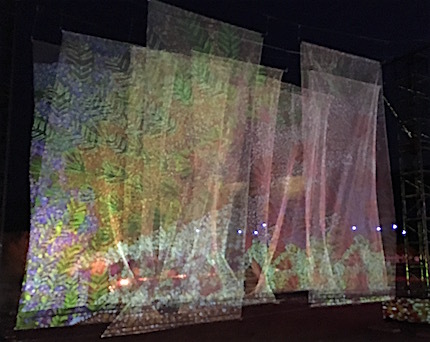 The fact of its creation lends new authenticity to the light festival, which last year struggled to get past being a cultural import (from Sydney’s Vivid, at the instigation of the NT Government) dressed up in local clothing. This year with senior Arrernte men and women putting their stamp on the display through this song, and the soundscape of which it is the core, there is an important new grounded-ness. In fact I first listened to the soundscape in the festival space titled Grounded. The technology here is a repeat of one of last year’s features, digital projection of artworks onto the ground, although the art itself is new: works by Ikuntji Artists Eunice Napanangka Jack and Gordon Butcher, Arrernte artists Patricia Ansell Dodds, Carol Turner and Greg McAdam, and Lindy Brodie from Barkly Regional Arts. As the light show was about to start, this projection was halted and the ambient part of the soundscape began. 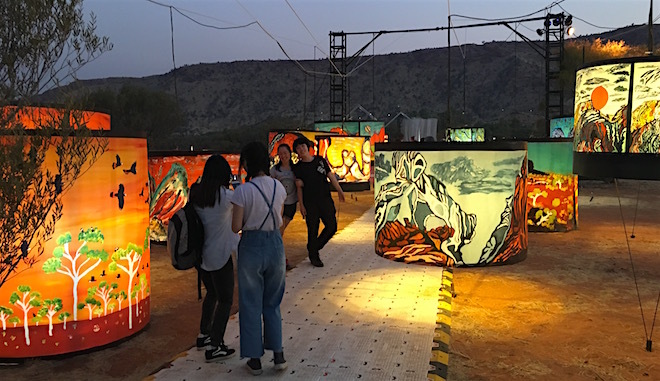 Above: Visitors interact with a projected image of a painting by Lindy Brodie, “Bridge, Train, Swans”, in the Grounded installation as lights begin to play across the range. He explained that some of the Parrtjima artwork comes from Mparntwe and surrounding estates, Antulye and Irlpme. Some is from artists in other places, and “we welcome them here, their paintings and their stories”. It was a warm, open-hearted message. 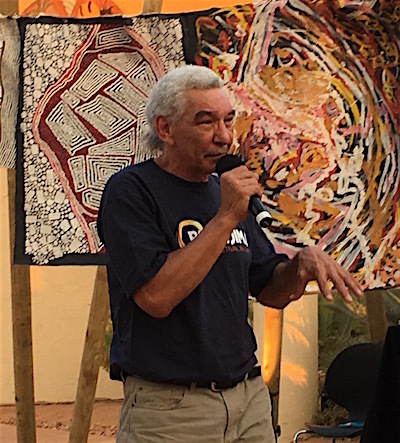 Next we heard the gravelly voice of senior man Peter (Coco) Peltharre Wallace, speaking in Arrernte, this time without translation, but soon arriving at the title of the song, “Apmere Ahelhe Itethe”, repeating the phrase over and over in a rhythmic chant, building towards younger voices taking it up – multi-tracked Warren H. Williams, I understand – with a whispering suggestion of other voices worked into the music. Powerfully amplified, it was an enthralling aural experience. But the ground in front of us was bare and vacant and seemed to be calling out for dance, for the rhythmic stamp of feet on the earth. The lights on the range had picked up in pace and a degree of visual interest. There was a motif suggestive perhaps of swarming caterpillars (after reading the interpretive panel on a return visit, it seems likely this motif is supposed to represent water beginning to flow after rain), another perhaps of the painted chests of warriors or their shields (the interpretive panel refers to “markings” that show “we have always been here and we are strong”). But relative to the inspirational scope of the song, the lights felt underwhelming, an expensive backdrop to a drama that was missing. Interestingly, I had just come from a talk by Greg McAdam (left), part of the festival’s Knowledge Program (a new and welcome feature of the program). He had told us how he had turned his back on elite-level football to come home to Arrernte country (Yamba is his Northern Arrernte homeland) and immerse himself in his culture. A series of paintings was hanging behind him, eight of them done over an intense period of two weeks some time ago when he was struggling to find answers about how to help Aboriginal youth become stronger, more confident, to make their lives more meaningful, “to give them well-being”. His answer finally was to teach them “story, song and dance” – in other words the cultural strength he had found when he returned home and set about learning through his Elders. This has become the core activity of camps for young men offered through the program he works for at the Institute of Aboriginal Development, the Senior Arrernte Men’s Program and within it, the cultural knowledge transfer program, partnering with local schools. “If we are going to empower our young men we need to not only put mainstream education intellectually into their heads, we’ve got to put culture into the soles of their feet,” he said. Young men who have been through the camps can now “dance, paint themselves up and sing the creation and the story and the dreaming of the Yeperenye”, he said, going on to suggest that this cultural knowledge can become “cultural capital”: some of the young men have already danced at functions and been paid for it. That’s what would have been great to see on the dark bare ground at Parrtjima, and that is surely the way the event needs to evolve. Better spend the festival’s resources – human and capital – with young Aboriginal men (and women) than on a light show grasping for cultural relevance and created by an interstate company. The payoff would not only be in their well-being but in the whole community’s. 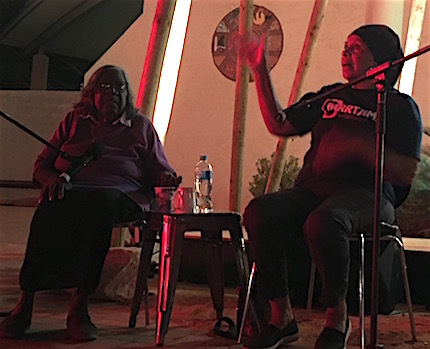 Right: ‘MK’ Turner OAM (left) and Kumalie Riley at the festival hub for the Knowledge Program. I hope that is what people take away from it. However, experiencing art through reproduction, which is essentially what the visual components of Parrtjima are, is a second level cultural experience by definition, in this case boosted by the addition of electric light. Watching visitors to the displays, I observed many seeming to be taken more by their fairyland ambience as a setting for playful interaction or as a backdrop for staging photos of themselves and their friends. The most subtle of the displays, the Medicine Space by Artists of Ampiltwatja (above left), Michelle Holmes, Julieanne Morton and Kathleen Rambler, was, while I was present, all but ignored by the crowd. 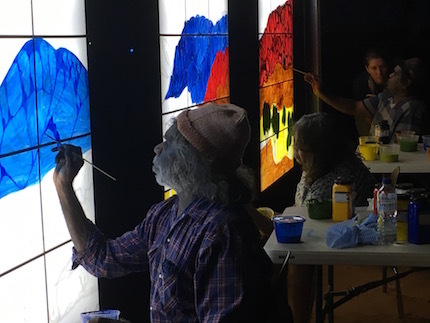 There is live painting going on as part of the installation of art from the Iltja Ntjarra/Many Hands Art Centre. The concept is inspired by the church at Hermannsburg, with its windows looking out onto country. A painting by Gloria Pannka is reproduced on one set of ‘windows’ (in an earlier version of this article mistakenly attributed also to Mervyn Rubuntja), while a rotating group of artists, Mervyn Rubuntja, in collaboration with Reinhold Inkamala, Vanessa Inkamala and Kathy Inkamala, work on completing the painting on the other set. What Parrtjima – A Festival in Light has so far failed to do is to offer artists the opportunity to themselves use light as their primary expressive medium. The necessary investment in professional development – exposing them to what has been achieved in this medium around the world and introducing them to the technical aspects – would be a more creatively enriching process for the artists and have the distinct benefit of yielding original work. If this were to happen, in addition to involving live performance of “story, song and dance”, the festival wouldn’t feel for the most part like such a mediated, second hand kind of experience. Which in simple terms is tax payers’s money. And none of that ‘commercial in confidence” crap either. 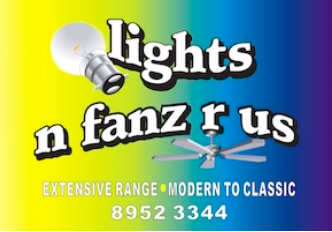 I doubt very much if the Arrernte people asked for this mob from interstate to come and put on a light show. 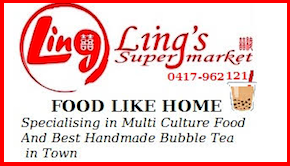 Commercial firm invests a lot of dough in the technology. Game plan is that they need a ‘sponsor’ to put on their show. Without one shred of solid evidence. And even if it was true, it translates as “taxpayers subsidising the accommodation places, mostly interstate owned. Great to see Apmereke-artweye, Benedict Stevens, involved. 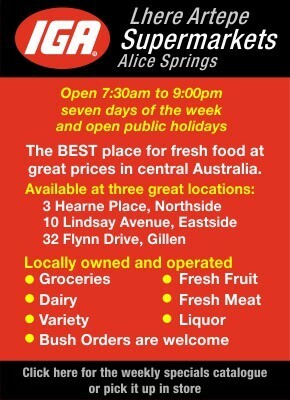 He is the owner of the area we now call Alice Springs and as a community we should support and get behind him. 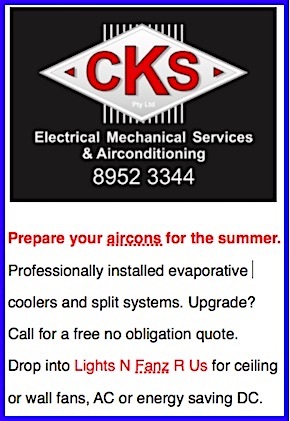 A side note – the organisers should be using the correct eastern/central Arrernte spelling ‘Pwarrtyeme’. 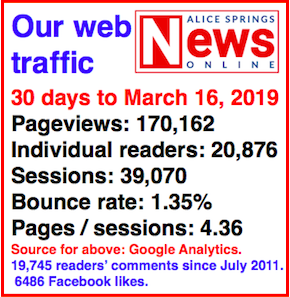 The current spelling ‘Parrtjima’ is using the western dialect and is not the correct language for the Alice Springs area. It may also encourage the public to use the correct orthography, developed by Arrernte language workers since the 1980’s.